It was the winter of 1998. I just ended my first semester of college and I was bedridden from an operation. I couldn’t go join my family for Christmas celebration a few rooms over. I couldn’t hang out with my friends. And somehow, I was okay with all that. For I had just received for Christmas the game that would soon become my favorite of all time. I had received The Legend of Zelda: Ocarina of Time (Collector’s Edition). Once I had put in that golden cartridge into my Nintendo 64, I was mesmerized by the opening cinema of seeing Link gallop on his trusty steed Epona across the expansive fields of Hyrule. It wasn’t until I saw the Kokiri Forest that I was truly astonished, however. I had never seen such beautiful scenery in a videogame filled with such astounding graphics and particle effects. The game just kept getting better and better as I progressed. The Legend of Zelda: Ocarina of Time is considered one of the greatest games ever made and was as innovative and influential to action/adventure games as Super Mario 64 was to platformers. Thirteen years later, games are still following trends set by this game. Ocarina of Time was the first Zelda game in 3D. 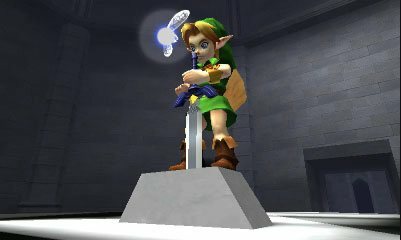 Some of the innovations established by OOT were its new lock-on system, where you would press the Z button and lock-on to an enemy, making 3D battles far easier than they had been before. It introduced context sensitive buttons, where the use of the button depended on the circumstance. It also introduced automatic jumping where Link would jump gaps himself if he had enough forward momentum. Though not new to Zelda games, OOT introduced a musical instrument as a main item of the game, a trend that would be followed by Majora’s Mask, Wind Waker, and, allegedly, Skyward Sword. Before, musical instruments had been relegated to be used sporadically, such as using the warp whistle to warp from dungeon entrance to dungeon entrance in The Legend of Zelda. 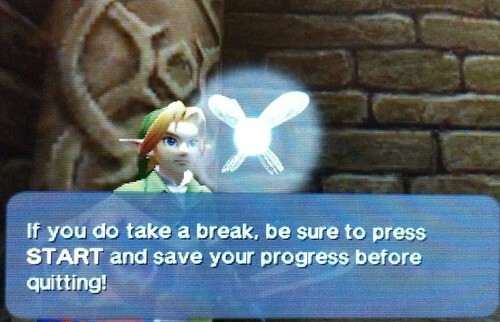 In OOT, the Ocarina allows you to warp, communicate with friends, make stones appear and disappear, etc. The Ocarina of Time is a very versatile item that has become as iconic as the Triforce and Master Sword to Zelda fans. The Legend of Zelda: Ocarina of Time 3D is a remake of the classic Nintendo 64 game. However, it is not the first time the game has been rereleased. The game was initially released on a gold cartridge on November 21, 1998 and later on a gray cartrige. Different versions of the game were released on the N64. Some of the changes made to these versions include the removal of the Fire Temple Chant, the alteration of the Mirror Emblem Shield, and the alteration of Ganon's blood from red to green. The Gamecube and Wii Virtual Console versions reflect the later versions of the N64. 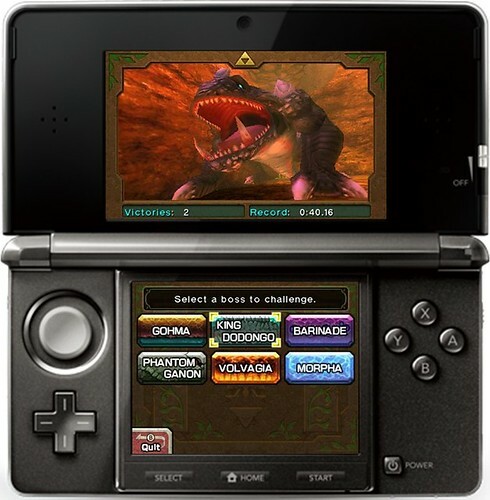 The 3DS version of the game also reflects these changes. 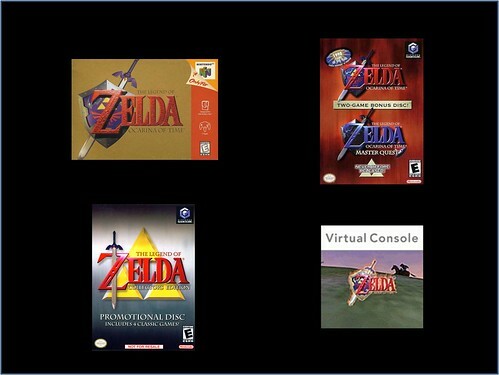 Ocarina of Time’s many releases. The story in Ocarina of Time starts off simple enough. 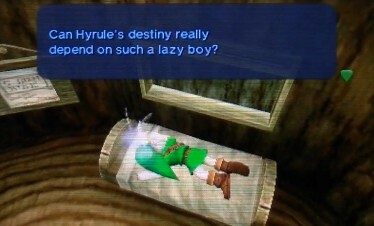 Link is a Kokiri boy without a fairy. A fairy called Navi comes to him one day and tells him that the Great Deku Tree, guardian of the Kokiri, wants to see him. He asks Link to rid him of a curse by defeating the monsters that have infested his body. After Link defeats the monsters, the Great Deku Tree tells Link that he must stop the wicked man of the desert, the one who cursed him, from taking over Hyrule. He tells Link to go to Hyrule Castle to meet Princess Zelda and show her the Spiritual Stone of the Forest, which Link had just retrieved. The Great Deku Tree dies soon after, because the curse had been lifted too late. Link goes to Hyrule Castle and meets Princess Zelda who had known of his impending arrival from a dream. Zelda tells Link that Ganondorf, the wicked man of the desert, wants to take the Triforce, a mystical object that grants one wish to whomever touches it, to rule over Hyrule. In order to stop Ganondorf, Link must find the other two Spiritual Stones and find the Triforce before Ganondorf does. Link finds the Spiritual Stones and goes back to Hyrule Castle to claim the Triforce, and that’s when his adventures take a most interesting turn. What follows is an epic adventure full of monsters, elves, wizards, thieves and…time travel? Yes, time travel, in a Zelda game. Up until then, The Legend of Zelda games had been pretty straight forward fantasy stories, the most outlandish being A Link to the Past, where Link travels between a Light and a Dark World. 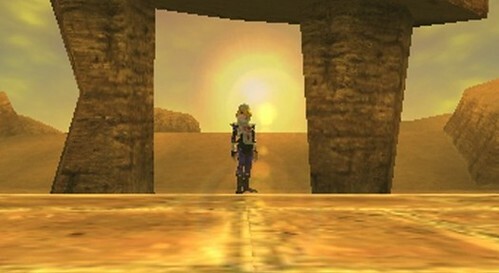 However, OOT raised the bar by adding a brilliant time travel element to the story. In order to defeat Ganondorf, Link must travel all over Hyrule and find the sages who have the power to imprison Ganondof for eternity. In order to do so, the Hero of Time must travel back and forth through time using a different set of skills when he is a child and when he is an adult. However, Link is not alone in his quest. Along the way, he will meet many people (and creatures) who will help him along the way. His childhood friend Saria will give him his first ocarina and let him know where to go next. Darunia and Princess Ruto provide him with some things he needs for his quest, after he helps them, of course. Princess Zelda will provide the titular item in his quest. She also helps Link later on in his adventure, from behind the scenes. Kaepora Gaebora, a mysterious talking owl, will provide knowledge and the occasional ride. Impa, Zelda’s protector, will protect the titular damsel and teach Link a very important melody. 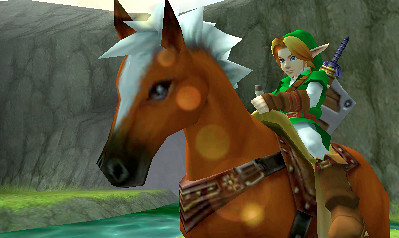 Epona, Link’s trusty steed, will help Link travel faster through Hyrule and access places he couldn’t access before. And Sheik, a mysterious stranger, appears to Link during his adult adventures. He guides him and teaches him magical songs for his ocarina. Everytime Link tries to get close, though, he escapes in a cloud of smoke. What is he hiding? Who is he…and why am I strangely attracted to him? Give me five more minutes mom. The Legend of Zelda: Ocarina of Time 3D looks absolutely amazing on the 3DS screen. Instead of giving Link and company a more realistic look, like the Resident Evil Remake on the Gamecube, Nintendo and Grezzo, opted to make the game look like the original concept art for the game. Both child and adult Link look like the illustrations we saw in the manuals when the game was released all those years ago. 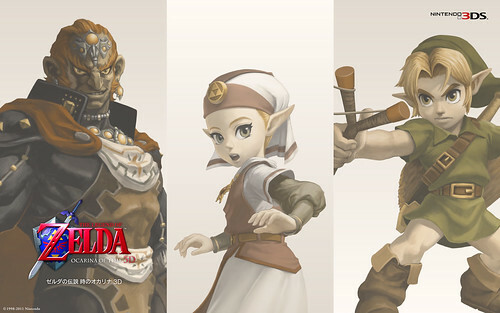 Impa finally looks like a woman instead of a man dressed like one. Zelda and Malon are even cuter than before. Kaepora Gaebora looks so much better. And Ganon looks fiercer than before. This is finally a fair representation of what the in game models look like. The environments have also received a significant upgrade, for the most part. Gone are blocky and muddy textures from before, replaced by impressive looking vistas. The shops of Hyrule actually look like real stores with items lying around. Jabu Jabu’s insides actually look organic. The Temple of Time finally has a ceiling. Hyrule Castle Town has undergone a major overhaul. Instead of ugly pre-rendered backgrounds which have gotten even uglier with age, the town is now represented with polygons rendered in real time. The difference is outstanding. Death Mountain actually looks like a real 3D mountain in the distance, instead of a cardboard cutout. Goron City is filled with murals. The Forest Temple looks like it has really been overgrown with vines, instead of carboard plants. And just wait till you get to the Desert Colossus. There are also new animations for some of the characters. For example: some of Link's animations have been changed, the dancing couple now have new moves, and Darunia really looks like he’s having a great time when he hears Saria’s Song. The game also runs at 30 frames per second up from the previous 18-20 frames per second, making the game run much smoother. There are some elements that haven’t been given a great overhaul, however. Castle guards still have a low polygon count. And some shrubs and bushes still look like 2D cutouts. The 3D effect in Ocarina of Time is one of the best I have seen for the system. The introduction sequence of Navi flying through Kokiri forest in search of Link is simply amazing. You feel like you’re right there with her as she goes through holes in fences and bumps into one. The particles always floating around Kokiri Forest looked amazing in the N64 version. Now they simply look beautiful in 3D. Navi herself looks pretty cool with her aura of light projecting outwards towards the player. The 3D effect is not only relegated to movies, though. The whole adventure is in 3D. Menus pop out. Items that have been acquired float and rotate right in front of you, and musical notes seem to be projecting outside of the screen. All of the effects are subtle, but they all look great. Whether you are in dungeons or out and about in Hyrule, it seems as if you’re looking at a little three dimensional Link whose world is separated from yours by just a tiny screen. It’s a really magical feeling. The only downside to the 3D effect is that there is some ghosting present throughout the game. It really depends on how you are holding the system and the intensity of the 3D effect, but it is there. One element that has not changed, for the most part, in OOT3D is the music. It is the same as you remember it from the N64 version. The songs are played in midi instead of being orchestrated. When I first booted up the game, I was a bit disappointed at the music. I thought, "It sounds exactly like the N64 version." My feelings changed when I played the game, however. The more and more I played, the happier I was that the sound and music were the same. It brought a sense of familiarity and nostalgia that brought me back to that fateful winter in 1998. The music itself is excellent. In fact, it has to be excellent. The main item in the game is a musical instrument and if that doesn’t sound right, or if the songs are horrible, the game will fall apart. Fortunately, Nintendo had its composer extraordinaire, Koji Kondo, on the job and he composed one of the most unforgettable soundtracks in videogame history. Kondo: You had to put one orchestral piece in there, didn’t you?!? Yokota: Sorry. I couldn’t help myself. For the 3DS version, the sound and music were handled by Koji Kondo and Mahito Yokota (who worked on Super Mario Galaxy 2 with Kondo). They were in charge of remaking the music for the 3DS version which was a difficult process because the 3DS and N64, being different systems, produce different sounds. Therefore, each sound and musical piece had to be painstakingly remade for the 3DS to sound like the N64 version. There are instances in the game where you can notice that the games don’t sound exactly the same like, for example, when Ganondorf is playing the organ as you're climbing his tower. However, I have to commend both gentlemen, especially Koji Kondo, for sticking to their guns and keeping the old soundtrack instead of reorchestrating everything. There is however, one singular orchestrated track that plays at the end credits of the game. Here it is for your listening pleasure. The gameplay in Ocarina of Time 3D is pretty much identical to the N64 version. You control Link with the C-Pad, you press B for sword, the A button is contextual (open, talk, check, etc. ), items are assigned to the X and Y buttons, the R button raises your shield, the L button targets enemies and centers your camera, and the D-Pad turns your mini-map on and off. Ocarina of Time 3D brings a new touchscreen element to the game. 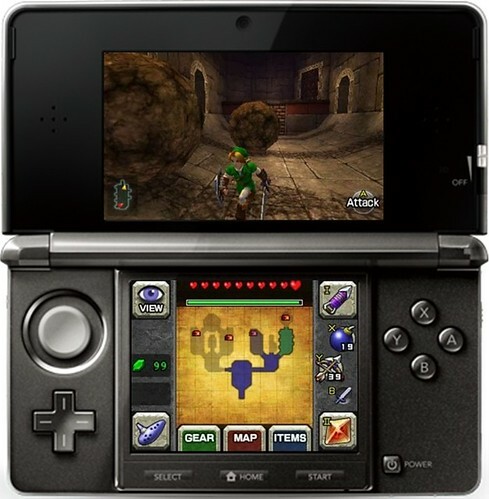 The main touchscreen displays: your camera button (touch to activate the camera and doubles as a Navi button), rupee count, key count (in dungeons), heart meter, magic meter, the Ocarina button (more on that later), touchable item buttons (where you can assign more items in addition to the X and Y buttons), a map of Hyrule showing your current location, and subscreen buttons. There are three subscreens. The Gear subscreen displays your quest items (you can change your equipment such as tunics and shield here). The Map subscreen displays the world maps and dungeon maps. You can click on both for more information and to display different dungeon floor maps. The Items subscreen displays all your non-quest items and allows you to assign them to the physical X and Y buttons, and to the touch I, II, X, and Y buttons. Ocarina of Time 3D’s touch screen is a game changer. The touchscreen is a gamechanger in Ocarina of Time. It not only frees the upperscreen from clutter, it also makes the game so much more fluid and easy to play. Instead of having to press start and fiddle through numerous touchscreens in order to access a non-quest item, you just press the Item subscreen and assign the item to a button. The extra item touch-buttons also diminish the time you have to access this screen because now you have more item spaces. The fact that the Ocarina has its own button also means that you have one more item space freed up all the time. All of these additions mean that the Water Temple is much easier to play, since you can change your boots instantly without having to pause the game. The temple is still difficult as hell, though. The Water Temple: Still a pain after all these years. Speaking of the Ocarina button, when you press it, a touchable Ocarina appears on the touchscreen. 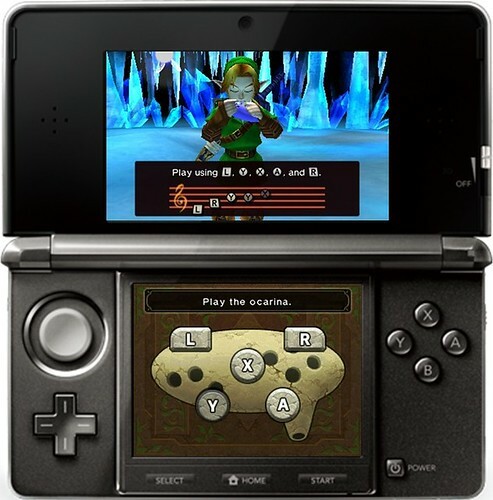 You can play the Ocarina by using the touchscreen or by using the physical L, R, Y, X, A buttons. If you press the Notes Icon in the Ocarina screen, you can access the notes for all the songs you have acquired and play them from here. This is extremely helpful for when you forget the notes to a song (which happens all the time to me) and it’s much easier to use than the similar Notes Screen in the N64 version. I still use the physical buttons, though. If you press the Camera Icon you can control the camera with the C-Pad, just like in previous versions. However, you can also control the camera, simply by moving the 3DS system in the direction you want to look. This is a huge improvement to the analogue control because it is much faster and much more precise. This motion control also applies to all items where you can aim in first person, such as the hookshot and arrows. The controls for these weapons are far more precise than they were in the N64 version. When the 3DS was first announced, I was worried that the lack of a second C-Pad would make it very difficult or impossible to play first person shooters on the system. After using the camera in Ocarina of Time 3D, my worries have greatly diminished. A new addition to Ocarina of Time 3D are the Sheikah Stones. These stones resemble the Gossip Stones that you can find throughout Hyrule but they are bigger and animated. They sort of remind me of a cross between a Gossip Stone and Gyroid from Animal Crossing. If you enter the stone through the mouth, you will be able to access “visions of your future,” which are pretty much videos that show you hints of what you need to do next. These are a cool addition to the game that, while not much use to us OOT veterans, will help out new gamers tremendously whenever they feel lost, without holding their hands like in other recent Nintendo games. The videos themselves are pretty cool too. If you have played Prince of Persia: The Sands of Time, then you have a pretty good idea of what these visions look like. If not, then take a look at the following video. Another truly awesome addition to the game is the addition of The Legend of Zelda: Ocarina of Time Master Quest. After you beat the game once, you are given the option to play either the Original Game or the Master Quest version. Master Quest is the same game that was released for the Gamecube where the original game is changed to make enemies harder, and dungeons were rearranged to be more difficult. Also some Skulltula locations have been changed and certain optional items in the original version (like the flame arrow) are now necessary to complete the game. The new Master Quest uses the same engine as OOT3D. Therefore, everything looks and controls better and is in 3D. There is one major change, however. The Master Quest is now mirrored. What was to your right in the Original Version, is now to your left, and vice versa. It may not seem like much but, when you’ve spent thirteen years playing the regular version of the game and knowing where everything is, playing a mirrored version can be disorienting, in a good way. It’s Twilight Princess all over again! The last major additions to the game are the Boss Challenge and the Gauntlet. You can access the Boss Challenge Mode after you are able to return to the original timeline for the first time. You can access it from Link’s bed. From the Boss Challenge menu, you can fight bosses that you have already defeated, except for the last two bosses (Boo). Boss battles are timed and you have access to necessary items to defeat them. You’re going to have a lot of fun with this mode. After you beat all the bosses in the Boss Challenge, you unlock the Gauntlet. In the Gauntlet, you face all the bosses in a row and your damage carries over. After defeating a boss, you can choose between one of two treasure chests (a big one and a small one) which contain helpful items. The Boss Challenge and Gauntlet modes for Master Quest are more difficult. Watch the rest of my Boss Challenge mode videos in my upcoming Boss Challenge/Gauntlet Strategy Guide. The Legend of Zelda: Ocarina of Time is my favorite game of all time. The gameplay is fun and tight, the music is phenomenal, the story is unforgettable, and the game looks beautiful. I thought there was no way the game could be improved upon. How wrong was I? The new version improves on all areas that have not aged well, such as the graphics, and improves upon others, such as gameplay, making the game much easier to control and more fun. Areas that didn’t need to be improved upon, such as story and music were, thankfully, left unaltered. I would like to congratulate Shigeru Miyamoto, Eiji Anouma, Koji Kondo, Mahito Yokota, and everyone else from Nintendo and Grezzo involved in the making of this masterpiece. Developers take note. THIS is how you improve upon perfection. Now, where’s The Legend of Zelda: Majora’s Mask 3D? Very nice review and pretty much sums up my feelings perfectly. That was an entirely epic review. Great review! You really captured the almost magical feel of playing OOT at launch. And I like the captions throughout. Also, The lens flare in the Epona pic makes it look like he has some sort of virulent horse illness. I don't have this game yet, but hearing that the boss rush is worthwhile and that the port is high-quality (with an improved framerate) makes my wallet hand itchy. @chrisbg99, @Zero, @Anand. Thank you for the kind words. Ocarina of Time is an epic game. It took me 51 hours and 24 minutes to finish both quests, both boss challenges, and both gauntlets. So if anyone is on the fence because they are worried about the game's length, the have nothing to worry about. I am now working on the Boss Challenge/Gauntlet Guide. I wanted to release it today, but I decided to add some videos to illustrate my strategies and that delayed it a bit. I could still release it today because all the videos are done. However, I'm not entirely happy with the quality of the Barinade video. There are are some issues with the camera focus. I might still release it and just update the video later. What do you guys think? That sounds like a good idea. Why not? Articles are never finished at Negative World! The Gauntlet is tough. Well, Bongo Bongo is tough. @Anand I'm uploading the videos right now and writing the descriptions too. Use my strategy above. It makes Bongo Bong a walk in the park. I know I still haven't detailed the strategy in words but it really is very easy. The one thing in my strategy that is different than the video is that I use the motion camera instead of the C-Pad. It's much faster and precise. Unfortunately, I couldn't film the movements so I had to do it the old-fashioned way. Still works great though. I will detail when to use the gyroscope in my guide. Excellent review Sir Master Sephiroth. I appreciate the thoroughness in your coverage of the game, the way you added a personal touch to your history with the game, and noting the minor imperfections about the game that, ultimately, do not affect the overall quality of the experience, in your eyes. I'm sure many of us here, wherever we were in 1998, were simply captivated by the impact Ocarina of Time had. I know I definitely was, and since then, I have re-played the game countless times. Just not in 3D yet! I really liked the structure of the review and the juicy tidbits of information, including changes made from the original releases. Oh, so there is one orchestrated track in the game. It sounds great! That's a nice video demonstrating the 'Visions' from the Sheikah Stones. The 'visions' are not too revealing, but give you just enough a hint to push you in the right direction it seems. And your video where you fight Bongo Bongo shows just how simple an additional animation makes the game feel more alive: the way Link flails around in the air with the beat of the drum simply looks fantastic. It's those kinds of touches that make me want to get this game even more. I just recently beat OoT again on the GCN bonus disc, so I wasn't in a hurry to play it again so soon. But I will definitely be getting this game later on, considering it is the definitive version of Ocarina of Time. Tell me about it. The first thing I usually do as an adult is go grab the Biggoron's sword. I don't get to use it in boss rush. BTW Seph, can you confirm that the chests in Gauntlet mode give you random rewards? I've played through it twice and got a bottle at one point and a crappy deku nut the next time. Makes you wonder why there's two different chest sizes if there's no reason to memorize contents. Thanks. I'm glad you enjoyed my review. It was a lot of fun writing it. I really loved doing the videos too. The Bongo Bong fight would be even easier if I could demonstrate how to use the gyroscope. But I would need 3DS capture technology for that. Check out the rest of my strategy videos tonight. Yes I can. I tend to use the small chest (I find it gives me better rewards on both gauntlets). This is what I usually get in the normal gauntlet and the order in which I get stuff: bombs, heart container, empty bottle, big quiver, longshot, potion (green/blue), heart container/hover boots. Wow, you make Bongo Bongo look a LOT easier than I remember him being, haha! Good job on that! Good review, even though I won't get this game ever. Nice to hear that they made some positive changes for the Water Temple. "You are parked on Orange Level." Too bad it had to take a parking garage to make Ocarina of Time easier to navigate, haha! Is Sheik the one with the more feminine model? Wow, you make Bongo Bongo look a LOT easier than I remember him being, haha! Good job in that! Thanks! I've seen it done with the sword, but it's so much easier and faster with the bow and arrow. Thanks for the complement, but why are you not interested in the game, if you don' mind my asking? And that parking garage joke, brilliant! I remember using the Bow and Arrow. I was just getting TOSSED over and over again. He probably gave me the worst trouble out of any boss in that game. I think I had the Hover Boots on. Hmm, I don't know. Anyways, again, you made it look simple. Impressive. Your review was very complete and answered nearly any questions I could have about the game (should I be interested), and I even learned a few things about Ocarina of Time on the N64. I never knew that that was the Owl's name, for example. And I didn't know much had changed from each version to revised edition. I have a standard Gold cartridge, and I've never been through the game on another platform in full. Your review is a benchmark for which many could only hope to reach (I say this having not read too many reviews on NW, so don't freak out, people!). A sliver of this would be PERFECT for the database (depending on who you ask. Ahem. ), and you certainly have a knack for writing. Add some games with us (besides these 4 guys)! 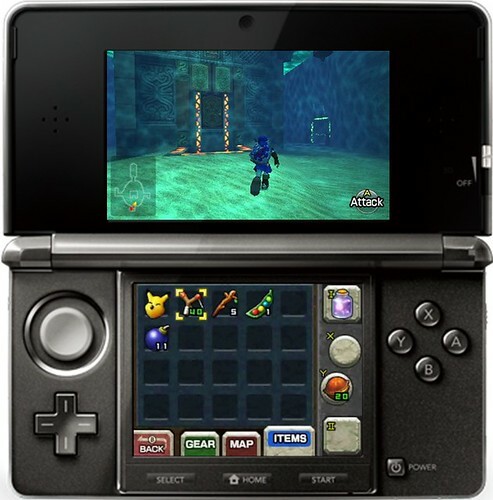 As for not getting Ocarina of Time 3D: I hate handhelds, of course! @Mr_Mustache Thanks a lot! I truly appreciate the support everyone has given me. This is actually the first time I've written a review for a game, ever. My only other review was for the 3DS system itself. I had a lot of fun writing both reviews! Now that I've gotten my feet wet, you can expect more reviews from me. They will probably be shorter, depending on the game, of course. However, if they ever announce The Legend of Zelda: Majora's Mask 3D for 3DS, you can be sure I'll get right on that! Now with regards to your hate for handhelds, I'm on the other side of the equation here. Handhelds are my primary system. I just love carrying my 3DS around with me everywhere and knowing that I can get my gaming fix whenever I want. And with the PS Vita (what a horrible name) coming next year I'll have a lot more variety from my handhelds. I catch a lot of public transport. I spend anywhere from 5-10 hours a week simply sitting down in transit. Handhelds are a godsend. My DS has probably gotten more playtime than any other console I've ever owned. Oh, great review! But I didn't really read everything I was just scanning. I love the first part of the review when you mentioned your memories about the game. I also have a good memory about Ocarina of Time even though I didnt play it in 1998 I only played it last year! Oh I really hope they will release a 3D version of Wind Waker! 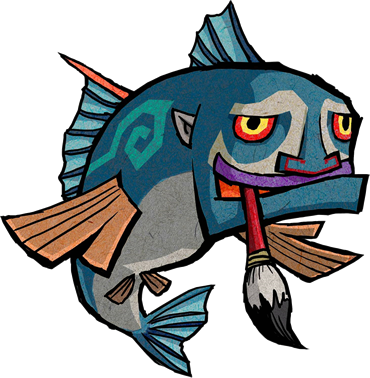 and I hope they will change the appearance of the creature in the water that calls Link " " hoy small fry. " If I had the ability to take videogames everywhere, I KNOW I wouldn't get ANYTHING done. Its probably better this way. At work, I found a "cell phone charger" plugged into a powerstrip where nothing else should be plugged in, and I took it out as soon as I saw it. I saw something else shiny laying on the floor, and its Chrono Trigger DS... Yeah, the game. Just the little card (are they really that small???). My co-worker asked me about the charger, and I told him it was in the drawer (sitting right next to the game). The charger was gone, and the game is still in there... Uhhhh... I'm unsure what to do with the whole situation. He definitely shouldn't be playing games at work..
Haha, videogames are meant to be played on a television set! @Mr_Mustache Submitted for the approval of the Midnight Society, I call this story "The Tale of the Vanishing Charger." Update on Boss Strategy Guide: I have 4 videos up already and I'll continue to upload them tonight. I still haven't finished the written portion (up to Phantom Ganon) so I'll finish this up during the week (I've got work during the next following days). I'll keep you posted on my progress.